‘Fruit large, about the size and figure of the summer Bon-chretien, without the protuberances of that variety: it is much swollen a little above the middle, going off to the eye either abruptly or gradually, and tapering straight to the stalk, without any contraction of figure; when fully grown, it is four inches and a half long, and three inches and a half in diameter. Eye close, in a deep hollow, surrounded by knobs, ribs, or broad protuberances. Stalk one inch and a half long, strong, bent, woody, inserted in a deep, irregularly and obtusely angled cavity. Skin bright green when first gathered, changing in a short time to a bright orange, with a little trace of russet. Flesh clear white, a little gritty towards the core, but otherwise perfectly tender and melting, juicy, with a delicious, rich, aromatic, saccharine flavour. In eating from November till January.’ [George Lindley – Orchard Guide p.393/1831]. 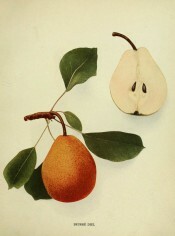 ‘This noble Pear was raised by Dr. Van Mons at Louvain, and by him named in honour of Dr. Augustus Frederick Adrian Diel, one of the most distinguished of the German Pomologists. Its great merit, independently of its excellence, is its fertility, both when trained on a wall and as a standard. In the former case, it will succeed perfectly on an eastern aspect. Its period of maturity is the end of November, and it keeps well till the beginning of January. 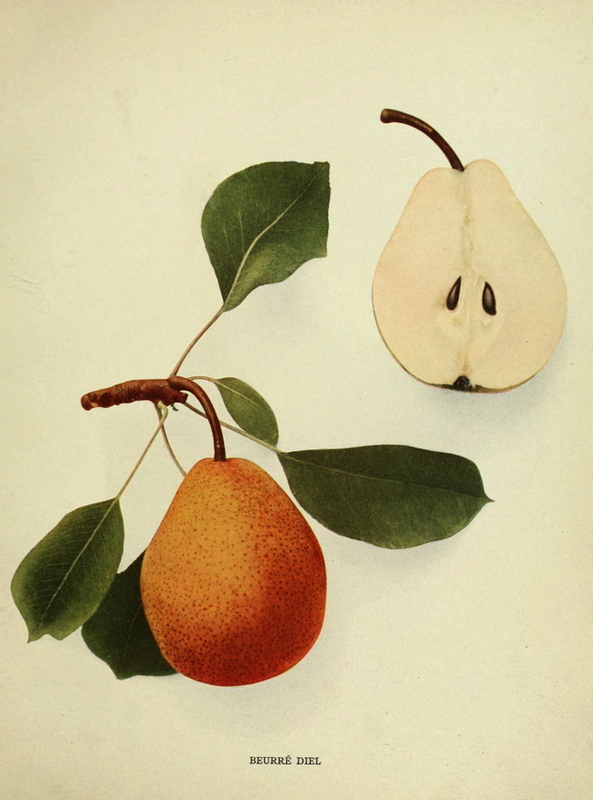 It is of the first rank among dessert Pears.’ [PM t.19/1829]. In reality it probably originated as a wilding at Les Trois Tours near Vilvorde towards the end of the 18th century, and was found there by M. Meuris, Van Mons’ gardener. Van Mons then named it for the celebrated German pomologist Dr. Frederick Diel. [HP pl.LXVI/1878, Gard. Chron. 1844, 1845, 1860]. Also figured in Pears of New York, p.134, the illustration used here, and Le Jardin Fruitier du Muséum [JFM vol.3/1860]. ‘Colour yellowish brown; form obovate; size large; quality excellent as regards the fruit and hardihood, as well as the productiveness of the tree: deserving most excellent cultivation. In use during February and March.’ [NHM vol.1 p79/1864]. Listed only in the 1857 catalogue in an Addendum as ‘Beurré Diel’ [Pear no.34/1857]. ‘34. April-May. Sweet and tolerably well flavoured but by no means equal to the best sorts.’ [Diary B, MP A2951/1862].